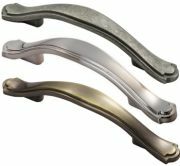 Stepped edge bow cabinet handle, cast in zinc alloy. Size 76mm centre to centre fixings, 24mm projection. 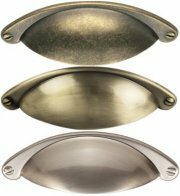 Available in Burnished Brass, Antique Steel & Satin Nickel finish. Traditional cup pattern cabinet handle, cast in zinc alloy. 64mm centre to centre fixings, 104mm overall width, 25mm projection. Available in Aged Antique Brass, Burnished Brass and Satin Nickel finish. Cup drawer pull handle, face fix in solid brass, overall size 4 inch 97mm x 43mm, projection 18mm. Solid brass plain cup pull handle. Overall size 85mm width, projection 18mm. Centre to centre rear fixings 57mm. Solid brass shaped cup pull cupboard handle, in an Art Deco style. Overall size 104mm width, projection 33mm. Centre to centre rear fixings 89mm. Solid brass large cup pull cupboard handle, available in 145mm or 221mm sizes. Overall size 145mm width, projection 22mm. Centre to centre rear fixings 96mm. Overall size 221mm width, projection 22mm. Centre to centre rear fixings 152mm. Solid brass metro cabinet handle in 96mm, 152mm, 203mm and 254mm fixing centres, 30mm projection, 10mm width. Solid brass heritage traditional cabinet handle in 96mm, 152mm, 203mm fixing centres, 32mm projection, 11mm diameter. Heritage Brass curved cabinet handle in 96mm, 152mm and 203mm fixing centres, 28mm projection. Solid brass Colonial cabinet handle in 96mm, 152mm, 203mm and 254mm fixing centres, 38mm projection, 25mm diameter back rose. Solid brass apollo cabinet handle in 96mm, 152mm and 203mm fixing centres, 35mm projection. Solid brass D pull cabinet handles. Available in 89mm or 152mm centre to centre fixings. Projection 32mm. Available in Polished Brass, Antique Brass & Satin Brass. Solid brass T bar cabinet handles. Available in 101mm, 152mm or 203mm centre to centre fixings. Projection 32mm. 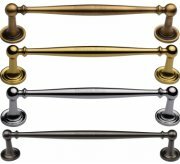 Solid brass ornate cabinet pull handle, 40mm height, 90mm width, supplied with matching face fix screws. Solid brass cabinet ring pull handle, 50mm diameter. Traditional pattern cabinet handle. Size 76mm centre to centre fixings, 137mm overall length, projection 25mm. Available in Aged Antique Brass or Antique Burnished Brass finish. Traditional curved pattern cabinet handle. Size 76mm centre to centre fixings, 130mm overall length, projection 23mm. Oxford cup pull cabinet handle, cast in zinc alloy. 76mm centre to centre fixings, 94mm overall width, 24mm projection. Available in Polished Chrome & Satin Nickel finish. Reeded cabinet handle, 128mm centre to centre fixing, 151mm overall width, 39mm projection. Shaker style cabinet handle, 76mm centre to centre fixing, 128mm overall length, 26mm projection. 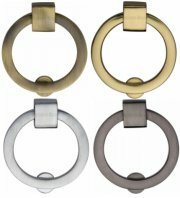 Available in Satin Brass, Polished Chrome & Satin Nickel finish. Large shaker cabinet handle, 96mm centre to centre fixing, 130mm overall width, 23mm projection. Available in Matt Satin Chrome & Satin Nickel finish. Hammered effect cabinet handles in a pewter finish for a traditional country kitchen look. Available in 128mm fixing centres, 154mm overall length, 27mm projection. Dimpled effect cabinet handles in a pewter finish for a traditional country kitchen look. Available in 128mm fixing centres, 154mm overall length, 35mm projection. Square plate cup pull cabinet handles in a pewter finish for a traditional country kitchen look. 90mm x 40mm back plate, 24mm projection. Reeded cup pull cabinet handles in a pewter finish for a traditional country kitchen look. 97mm back plate, 22mm projection. Chiltern cabinet cup pull handles in a pewter finish for a traditional country kitchen look. 64mm fixing centres, 110mm overall width, 30mm projection. A very simple beeswax drawer pull with no detailing but still looks great, especially against painted or natural wood in a kitchen or bedroom. Solid brass Victorian cup pull handle. An elegant cup pull that will look good in traditional or modern settings. With its overhead rainbow shaped tiered lines outlining the cup and the stepped front leading edge it hints of art deco. It has an unique style that will appeal to many. 76mm centre to centre fixings, 92mm overall width, 25mm projection. 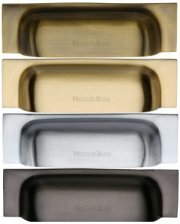 Available in Polished Brass, Dark Bronze, Polished Copper, Satin Copper, Polished Chrome, Satin Chrome & Satin Nickel. Solid brass teardrop cabinet pull handle, 66mm length, 34mm width, 13mm projection. Cheviot cabinet handles in a pewter finish for a traditional country kitchen look. Available in 128mm and 224mm fixing centres, 27mm projection.